1950 Simplicity #3237 vintage sewing pattern, misses' and women's one-piece dress, plus size 16 1/2. A sleeveless fitted bodice joins the flared skirt at the natural waistline and a self or purchased belt encircles the waist. 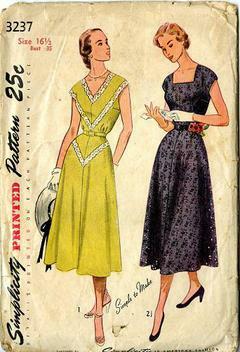 Style 1 features a V-shaped neckline and eyelet insertion is used as trimming. Style 2 is eyelet fabric and features a wide square neckline at front.